MSNBC & FoxNation: Horseman of Apocalypse Shows up in Cairo? This is a very feeble attempt to equate the uprising in Egypt with the Gloom and Doom of “Radical Islamic Muslim Al Qaeda Taliban” etc. etc. Just as there are varying degrees of Christianity, from moderate to extremely radical ( Westboro Baptist comes to mind ), so there are varying degrees of organizations and people of Muslim Faith around the world… and trying to equate the overthrowing of a Strong Man Dictatorship ( and, as Saddam was in the 80’s, “Our Thug” ) – which totally flies in the face of the NeoConartist worldview. The Vast Majority of Egyptians are Secular, meaning they want the separation of their Muslim Religion from their Government – Church separate from State – Much like Turkey, to a certain degree. Fox News ( and MSNBC if they have posted this story as well ) and their “reporters” are having a very hard time equating the Good People of Egypt with their constant spewing of the “Muslim ‘The Database’ Boogeyman” – and you can’t paint all people of Muslim faith with the Same Brush. And, by posting such a HOKEY after effects video, shows their true colors as a propagandist tool, and I hope that those people who use Fox as their primary news source recognize this Fact. And – if MSNBC posts this on their site without pointing out the obvious special effects, they’re just as guilty. Mubarak toppled is a great event for Egypt and their people IMO – from a 10,000 foot view, this is a victory for the true ideas for which Democracy stands. However, we all have to be vigilant about how the ruling corporate elites, that are trying to control and keep the true potential of humanity down, handle this developmen­t. From behind the scenes, who knows what is happening – Panic? Opportunit­y? Relief? I truly believe that ‘There is Enough Pie for All®’ – let’s take this Revolution in Thinking – which is what it is – as a lesson in learning to take care of each other and share… this could be a true turning point for Humanity. 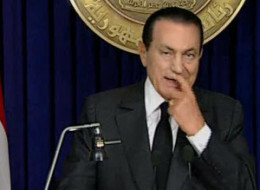 It’s my hope that it is handled in the best interest of all the Egyptian People, not just a chosen few of the elites. First of all, if you don’t follow the title, you can read part one here — that will get you up to speed on this particular post. Because of new opportunities on the horizon, I am rushing to complete many projects I have had on the back burner. And my motivation for writing this ‘Part II’ is that many of my friends and colleagues have asked me how I completed ‘Dawn in Leonardville’ in such a timely fashion. Looking back, I am amazed that I was able to do it at all, and as quickly as I did. It was the biggest piece I have done to date, and I did it while I worked full-time. I’ll just say this — setting a deadline with a financial boost for completion by that date helped a great deal. Also, FEAR of not hitting that deadline is a GREAT motivator as well. This commission and the completion of another piece of mine has led to me landing a Solo Show this coming April, here in Chicago’s Wicker Park. 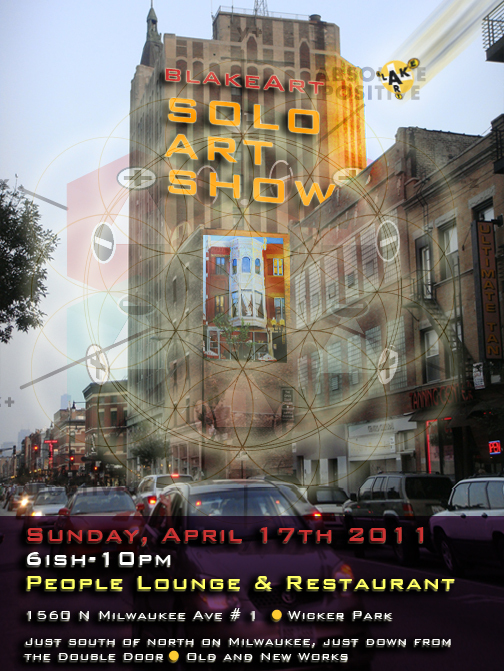 With that ‘Plug’ for myself being said, I am going to be super busy in the next 8 weeks preparing for the Sunday, April 17 opening at People Tapas and Lounge, 7-10pm — if any of my loyal readers are in Chicago or want to plan to come up, any and all are welcome. I am planning on having a few new pieces up and pesky unfinished pieces completed for the show, including ‘King of Procrastination,’ which I have been tweaking for the past 12 years. In finishing it, I might implode into a wormhole vortex… maybe it would be a good idea do finish that later. So Let me explain my approach to starting ‘Dawn in Leonardville,’ which was the title I thought of about one fourth of the way thru completing the piece. 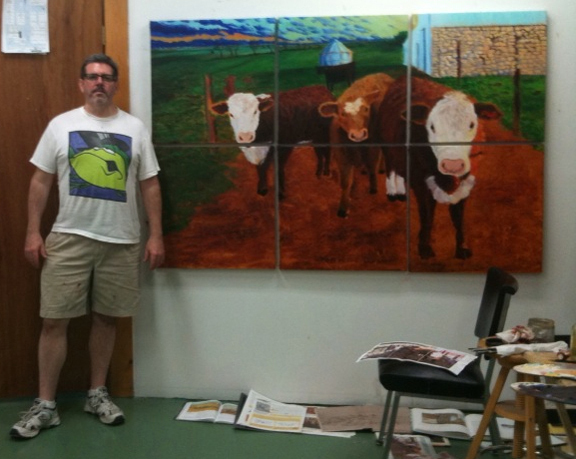 In part I, I mentioned that I convinced my Patrons who commissioned the piece that for shipping purposes and a variety of other reasons, executing the painting divided into 6 two-foot square canvases was the best approach. In my mind this was a logical, inexpensive and smart way to achieve their goal of an atmospheric art piece, the large size they desired, for what turns out to be a combination formal dining room and library. Hey Joe – Great post. Timely, relevant. I follow your comments and mostly agree with everything you usually say, but want to drive home a specific point. What the Powers that Be want us to believe is that All is Hopeless, We Have no Choice, Everything is Broken, Government Doesn’t Work, Our Kids are Dumb, They Can’t do the Job – it’s the Teacher’s Fault, it’s the Unions Fault – On and on. What Science is starting to tell us, however, is that is not the way the Omniverse™ works – not the way it works at all. And THAT is the Big Secret that is being hidden from all of us. Mankind is capable of anything, the most beautiful, the most inclusive, the most benevolent of existences­­­. But that is being fought tooth and nail – and why? The Power to control thru Money. Joe, it’s my hope that we’re all waking up to what is really at the core of why we are all here on this little rock spinning in this void of blackness. We have to cut ourselves slack, and these same “Powers that Be” as well – they have been bred to have no soul, no conscience­­­… and that horrible behavior is rewarded, while those with compassion get stepped on. Humanity should recognize and reward the more Positive Thought Structure™ that has always been within all of existence. As more of a Progressiv­e than a Liberal, but Liberal none the less, I as many of my like-minde­d peers subscribe to the Gandhi Mindset, or as I like to label it with my own terminolog­y, ‘Coming from the Gandhi Structure of Thought™’, which DOES exist, within the realm of something we all are a part of, the infinite of the Omniverse™­. That is, Violence is NEVER an option… but organized, civil disobedien­ce is and has to be a democratic option… having no secrets, no hidden agenda. Can those on the right say the same thing? Did you go and watch the videos this Jared posted? IMO, his writings reflect someone who is suffering from schizophre­nia, but more likely has bi-polar disorder..­.. he is tuning into something that in his mind makes sense, but in his explanatio­n of what point(s) he is trying to make, makes little to no sense about what he is trying to convey. In other words, his brain-tune­r and how it filters this reality, is way off-kilter­. IMO there is a huge attempt by the powers that be to influence the events taking place, how we perceive this reality, and place the blame on those who best fit pushing their agenda, mostly hidden. Personally­, It’s my belief that the powers that be want the Chaos to continue, with a divide and conquer mentality. Keep the lower classes at each other’s throats so they can maintain their grip on power. Thank the Omniverse™ for this brave woman who took action against this poor, misguided soul… what a waste ! Believe What I Say They Say! Anyone out there have friends who send you emails to justify their position and belief system? Trying to convince you, you of the opposite ilk, to come over to their side of the coin? I do… And feel free to share your own experiences as comments on this post. Since I suppose I am a part of the ‘silent majority’ per se, and one that speaks out more often than not, with opinions I have formed from my research and investigation, I have certain pals that occasionally and consistently, mind you, send me emails with assorted links of videos & snail mails even – with articles cut out, highlighted and personal notes stating their opinions. To me, this is the healthiest of activities, and one aspect of what life is all about. If I have an opinion and have held it all my life, and something new comes up to refute that, I am happy to hear any new knowledge with an open mind. And in the United States today, I believe we need much more of this honest, truthful and factual dialogue, minus the hidden agenda and preconceived prejudices. 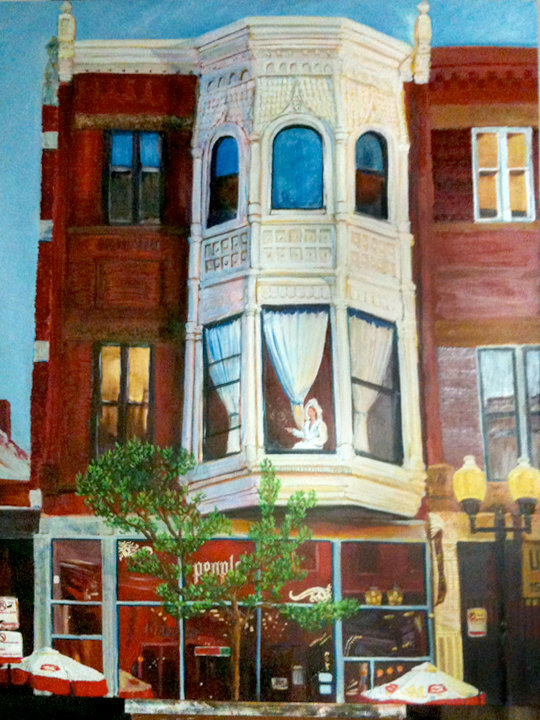 One of my most recent creations... based upon a scene I witnessed in Wicker Park 2 summers ago. Two examples – and I’ll lead with one that is cultural and really pretty hilarious, because this particular pal o’ mine, whom I have genuine affection for, not only hammers me on a regular basis for just about everything I think & believe, but is also very good-natured about it as well. I recently completed a painting I call ‘People – an Homage to Hopper. Self Promotion aside, I like Hopper… he has his shortcomings, his human side, flaws… but he did what he loved and stuck to it besides the pressures from the art world at that time. In this economy, you have to set yourself up to take advantage of every opportunity you can get… especially when you’re a Starving Artist. This is a quick story of how I was lucky enough to land a great commission, reconnect with an awesome family, and expand my horizons as an Oil Painter. Last year around November I got a friend request on Facebook from a super-nice gal I knew from High School, who was a year or two younger than me. After the usual “normal” Facebook pleasantries, I noticed she was a runner, and a marathoner at that. In my glory days, I fancied myself a distance runner, and ran cross-country and track during high school. But I also had an exceptional coach, who pushed my abilities well beyond my limited running talent. In my response to my new Facebook pal, I made the small talk of offering to critique her training schedule, and share some of my insights, pointers, etc, etc, based upon my coach’s superior training philosophies. With all of this friendly info, I also included a link to my blog, which has my artlinks off to the left. Much to my surprise, within about 72 hours I received a very animated response, with positive aspirations of not only the running info, but also her digging on my artwork – both the digital and especially my oil paintings. Second, here is my embellished comment: I am / was a big fan of all the Blago/Banksy graffiti that were sprayed all around Chicago – and I covered it extensively in 3+ Posts on my blog “The Structure of Thought™ – this is the way it has always been®”. It’s my opinion that you cannot patent a “style” of art ( you can invent a style, however, so that something can be “Banksy-esque” so to speak, even tho he didn’t “invent” it ) just like a medical or big pharma company can’t “Patent” a gene or a chromosome – even tho the law says you can. Just because it is legal, doesn’t make it right. That being said, the whole point of Art in its highest calling IMO is to generate positive Thought Structure™, discussion, and push society towards enlightenment. If you go back and read my posts on Ray’s Art it shows the noblest aspect to what the purpose of ANY art can do – call attention to issues, our culture, the flaws in our society, our misplaced values and dysfunctional aspects of the Pop Culture we have created. That is powerful, how one individual can help push society towards the positive. If you think about it, one good idea can change everything. Hopefully for the better.